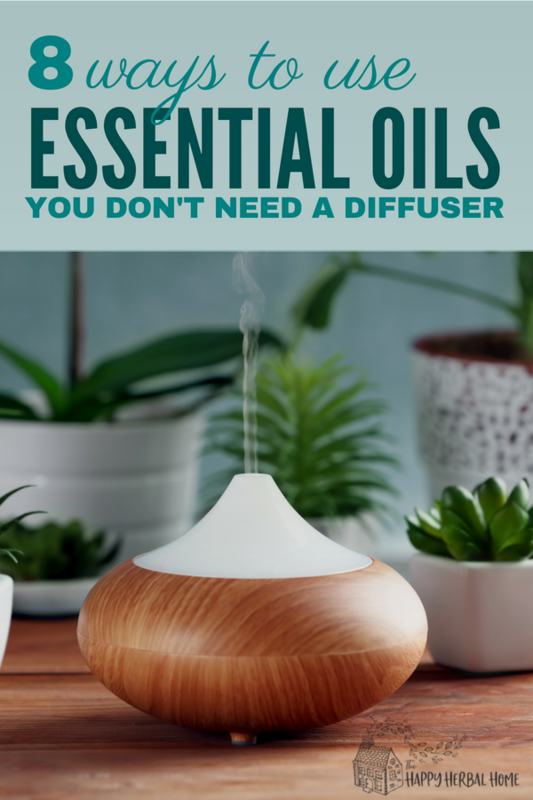 Sometimes you need to diffuse essential oils without a diffuser. Maybe your diffuser broke, or you don’t have one. Maybe you want to find a better method for using your oil other than diffusion. 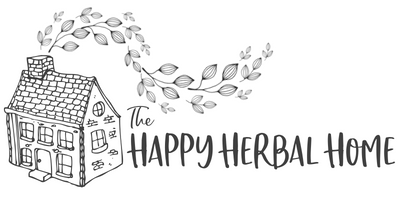 The therapeutic value of essential oils varies greatly depending on a number of factors, such as the method of extraction (which is usually done by a steam extraction method), the timing during which the plant being utilized was grown and harvested, and naturally, the medicinal power that is inherent to the plant itself. Typically, 100% pure essential oils are the ones that hold therapeutic value for a variety of health benefits. The definition of an essential oil is “a concentrated hydrophobic liquid containing volatile (defined as “the tendency of a substance to vaporize”) aroma compounds from plants. Essential oils are also known as volatile oils, ethereal oils, aetherolea, or simply as the oil of the plant from which it is derived. This method can be achieved through a variety of ways, the most obvious being to simply inhale nasally the vapors from the bottle directly. You can also soak a cotton ball with the oil and leave it in your purse to inhale all day. This can be particularly helpful to pregnant women or any other person experiencing nausea when they inhale a cotton ball soaked with peppermint oil or other anti-emetic essential oil. Another method is steam inhalation, which involves placing a few drops of oil in a bowl of steaming water, placing a towel over your head and breathing in the vapors that way. This method is probably the most used of all of the ways in which essential oils can be employed and involves no electric sockets or other electronic devices. This method can be achieved simply by placing 10 – 15 drops of the chosen oil in a bowl of hot water that has been salted with either Epsom salts or sea salt, which help with the diffusion process throughout the night. Other ways of achieving this method are by the commercially made and produced terra cotta bowls that are designed specifically for diffusing essential oils, or by soaking a cotton ball in the oil of your choice and placing it by your bed overnight (this is probably better for the very pungent or overpowering oils but is not quite as effective as the other natural diffusion methods listed above). Diluting any chosen with a carrier oil, such as Jojoba, Olive or Almond oil allows you to apply it directly to the skin without the risk of burns. This method is ideal for massage, or dabbing the blend onto your wrist, neck or other parts of the body. 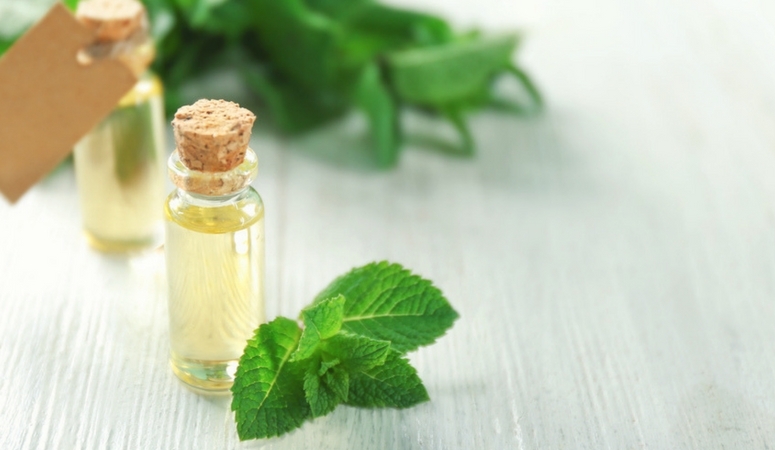 Diluting with a carrier oil is important as some oils, such as peppermint, wintergreen, lavender and others can cause burns if applied directly to the skin. This method is a great option if there are oils that would do best by direct contact but are too powerful when they are not diluted somehow. Placing several drops of any oil in a hot (preferably salted with Epsom salts) bath or into your shower basin provides for an aromatic and healing experience. Diluting an oil in distilled water in a spray bottle and then spraying on linens, clothes, etc. are both fantastic ways to “gently” receive the beneficial properties of the more potent oils. An easy way to use essential oils for a total body experience is by putting them in your bath. To do this, choose an essential oil or blend that you’d like to use and add it to cup of Epsom salt. Then when you’re ready, run a bath and toss in the Epsom salt. Enter your bath and enjoy the total body experience. Just choose your oils wisely, as some oils aren’t great for skin contact. 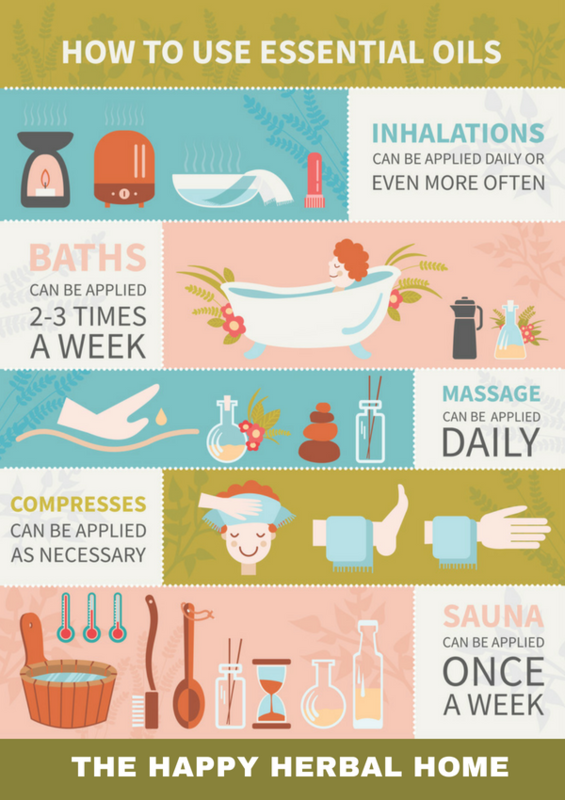 Another way to get the beneficial properties from essential oils is through compresses. This can be the preferred method when using for a localized reason, such as for a headache, a local infection or for cooling effects. To a basic compress take a bowl of hot or cool water, depending on the use, and add 5-10 drops of your essential oil. Then dip a cloth or rag into the water. Ring it out, and place on the affected area. If you’re a sauna user, essential oils are a great way to boost your sauna experience is to use essential oils. Simply place a few drops of oils in a small bowl and bring into your sauna with you. It will diffuse the essential oils into the air as it warms in the sauna. Of course, I have to mention using a diffuser for diffusing essential oils. We certainly live in a modern world, and there are a number of commercially made devices that deliver oil through electric diffusers that work in your home, office or car, and there are even diffusers that work via USB ports (that are reported to be quite user friendly and effective). I think it’s well worth the investment. But if you are in a pinch and don’t have a diffusor available, the other methods are great options to get the job done too!